Hello every one on my cosmetic blog. 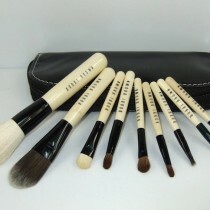 Make-up brush set by Bobbi Brown. Hi girls! I am Katie Lodge and I lived in several English cities before I have finally settled in Brighton. During 8 hours per day, I am an office worker employed in a big financial corporation. The remaining 16 hours of my day are devoted to sleep, friends, food and cosmetology. I love reading, testing and sharing my opinions about cosmetics with others, which is the reason for writing my blog. I hope, you will find here a lot of beauty inspirations.